Even Fiat make no bones about it with a sign on the back window that reads, "Wait until you see the front". 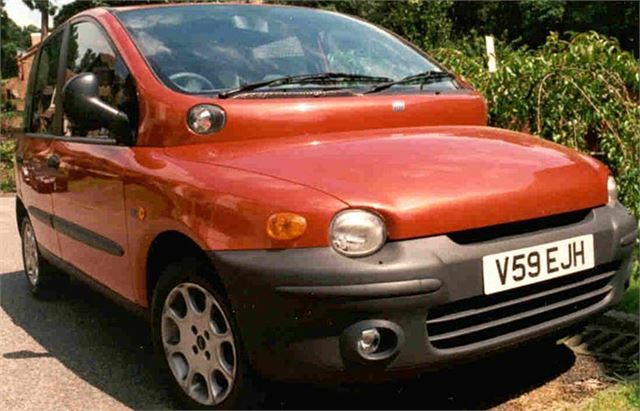 The Fiat Multipla is the weirdest looking new car on the road today. But that hasn't stopped it becoming one of the most fashionable cars to be seen in. It's very good to drive. 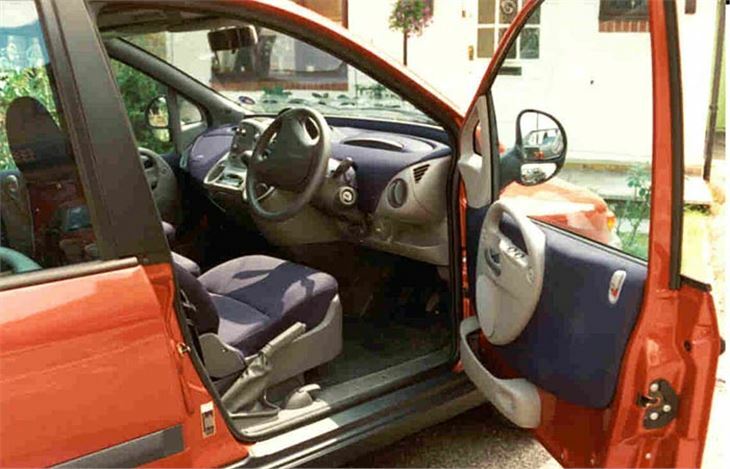 And the interior is amazingly (if not brilliantly) practical. 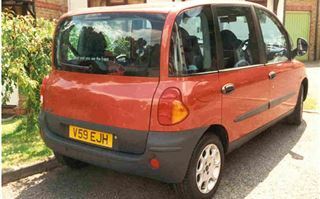 No other car of anything like its size can seat six in comfort with room for their luggage or their large dog behind them. The cab is 'walk-through' (or shuffle across) with no console, gear lever or handbrake in the way to impede progress from side to side. 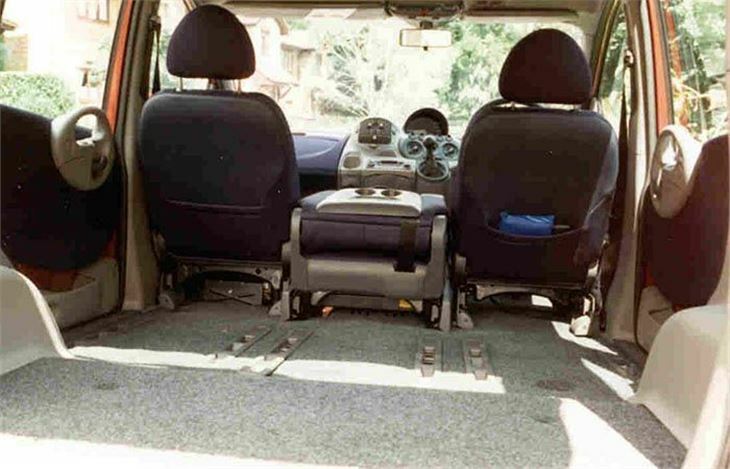 The front seats can't be removed, but the centre one can be replaced by a factory fitted 18 litre refrigerator. 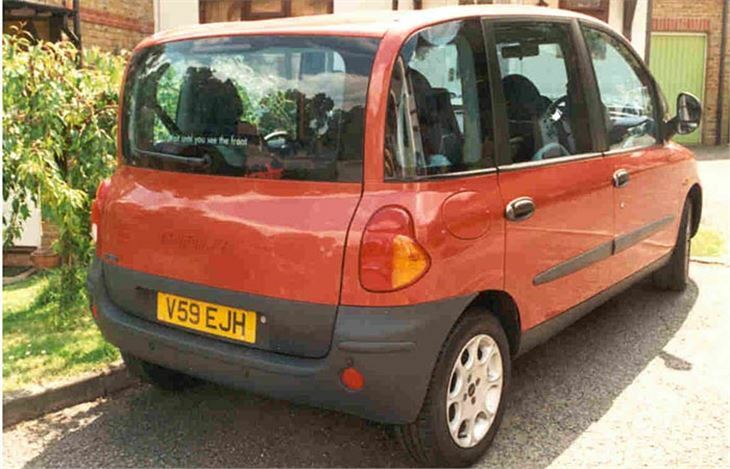 All the rear seats can be removed, just like those in a Renault Espace, and replaced further forward if desired to give more luggage capacity at the expense of legroom. 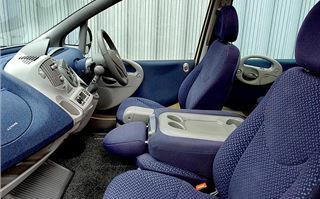 The photo shows just how much room is available in the back with the seats removed, though headroom is insufficient for most people sitting in a secured wheelchair. The dashboard is an astonishing sight and looks like something out of 'Star Wars'. One young boy passenger likened the multi-direction ventilator to a person's head, with eyes and ears. 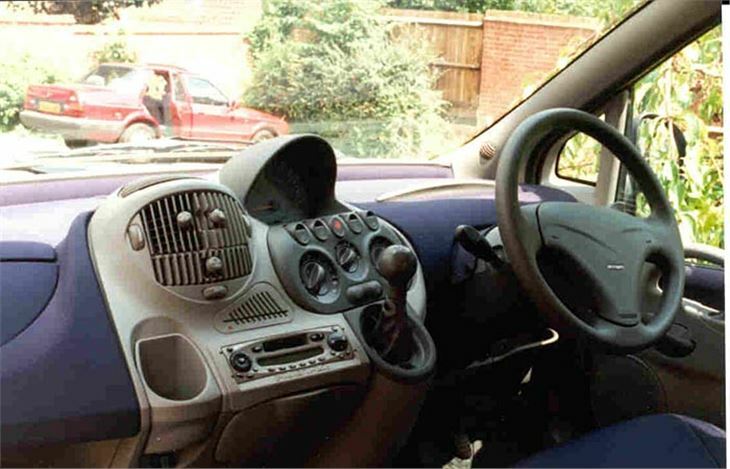 But it all works very well, including the stubby, dashboard-mounted gearlever. The non height-adjustable seat and height-adjustable steering wheel give a commanding driving position and the double lens mirrors give an excellent view of the kerb, making reverse-parking a doddle. The optional rear parking sensors aren't really necessary. Out on the, road most drivers are surprised at how much fun they can have (which explains the car's many awards by younger motoring journalists). The steering of the petrol engined version is well weighted and accurate and the wide-track chassis provides copious levels of grip. But the petrol version is a bit short geared and becomes both noisy and thirsty above 80mph. With the diesel, you sacrifice some of the handling poise for a longer legged, more relaxed cruise and far better fuel economy. Is it for you? There is no doubt that the quality of the interior trim is way below that of the Vauxhall Zafira, so I wouldn't think of the Multipla as such a good long-term proposition. 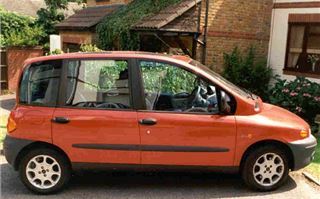 But that ignores the fun factor and the sheer brio of the Multipla. 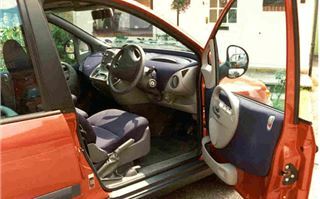 The solid and practical minded will undoubtedly go for the Zafira. 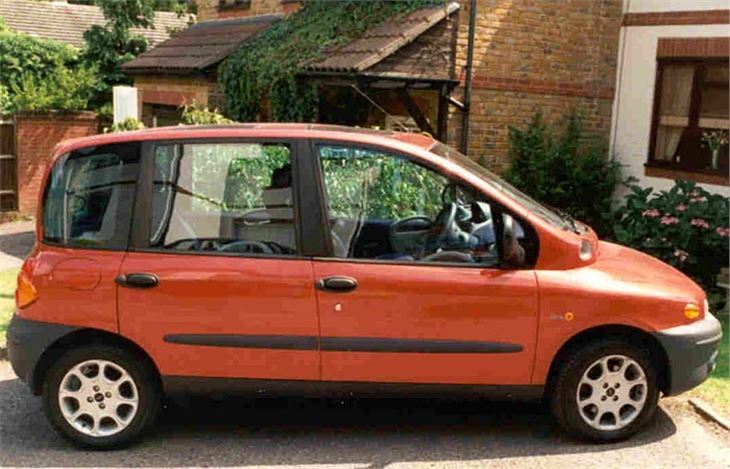 But the young at heart will cheerfully take a gamble on the Multipla.